← Beating away the January blues: CCR B Win! “My name is Von Sleaze, or Sleaze, and I make up part of the CCR ref crew here in Birmingham. I came to roller derby in September 2007 when I set up the Middlesbrough Milk Rollers with my best friend Germaine Leer (now DDR). I skated until July 2012 – when I decided to venture to the other side of the track – then with the Newcastle Roller Girls. I took up refereeing because I was injured. I Bench Managed a bout I was too injured to skate in and after ward Cherry Fury (SDRD) and Man Shaped Dog (TNF) took me aside and recommended I took up refereeing… I’ve never looked back. I get asked a lot if I miss playing. I do. But I’m a better ref than I was a skater. I stopped skating at my most successful and I don’t have a single regret. I was lucky in that when I took up refereeing, Newcastle had very few refs so I got a lot of help and encouragement. That carried on when I moved to Birmingham in December of the same year. I had three bouts under my belt, so still a completely newbie. Initially starting with the Crash Test Brummies I switched to CCR in September 2013. That’s a lot of teams to be a part of in such a short time in the game… but you shouldn’t be afraid to move around. Sometimes life forces you to. You will make new friends, you will fit in eventually. Grow some balls and do it. Good things happen when you put yourself out there. 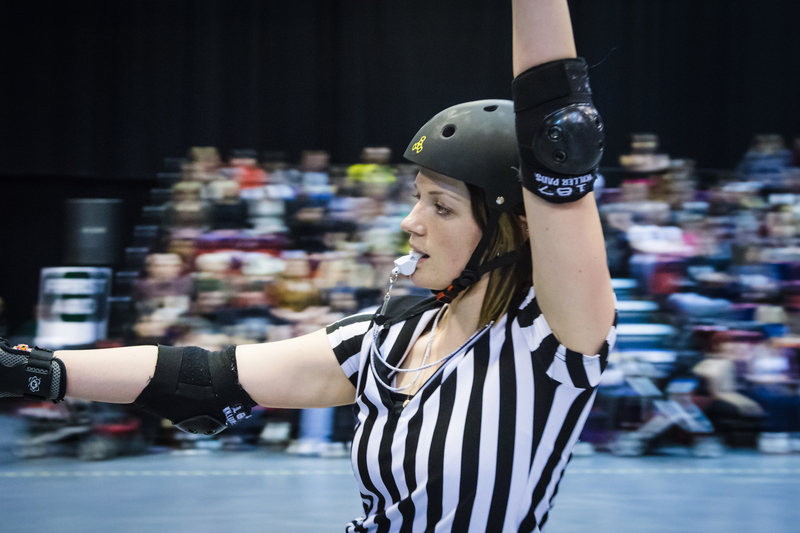 It can seem daunting as a female ref in what is a predominantly male officiating world, but there are Facebook groups to discuss specific issues we face and a lot of incredibly generous women out there willing and able to help with your transition to Team Zebra (and point you in the right direction during your time in stripes). My advice would be – Don’t be afraid to ask for help. If you’re stuck and Midlands based – look me up and drop me a message on Facebook. My second bit of advice – This is harder than it looks. It isn’t an easy way to be involved in derby. You are expected to stay fit, stay on top of the rules and the latest strategies being practised by teams. You will spend a lot of time travelling and working hard on improving. If you want an easy ride this isn’t the correct route. But if you put the effort in, it really pays off. In one year in the Midlands I have refereed the Men’s European Championships, a 24-hour-long scrim in Amsterdam, two UKRDA tournaments and over 30 other bouts. I have reffed in every position available and have now been picked as a Divisional Head Ref for the Heartlands Tournament 2014. It’s so worth it. And I love being part of the CCR ref crew. You can read more about Sleaze’s refereeing on her blog here. You should, its a good read, and pretty useful if you’ve ever dabbled with the idea of becoming a ref. Photo courtesy of Phil Seymour, You can see more of his amazing work (derby and otherwise) here.